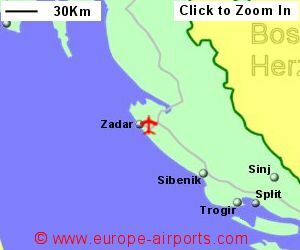 Find and compare the best prices from a range of well known car rental companies at Zadar Airport. This is a free to use facility, enabeling you to book direct with the company quoting the price. A bus service runs between the airport and Zadar bus station, timed to suit scheduled flights, at a price of 25 Kuna (approximately 3 Pounds). 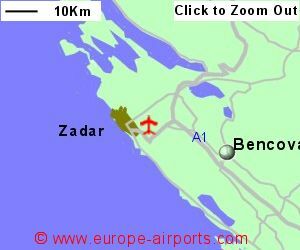 Zadar airport has 2 bars/cafes/restaurants, shop, bank/currency exchange facility, ATM, and free WiFi internet access. 589,000 passengers passed through Zadar airport in 2017, a 13% increase from the previous year.